Tooth loss is a common oral health concern, especially among older patients. Any degree of tooth loss can negatively impact the smile, but the consequences are especially severe when multiple teeth are missing. The best solution for advanced tooth loss is dentures, and more specifically, implant-supported dentures. At Signature Smiles, we offer implant-supported dentures to replace multiple teeth or an entire arch of teeth. Available as both full and partial dentures, these restorations restore oral function, support the jaw, and enhance the appearance of the smile. Our dental team is happy to go over full vs. partial dentures with our Woodinville, WA patients, and help them choose the restoration that is best-suited to their unique dental needs. Partial dentures are restorations that are fabricated to replace multiple missing teeth. These prosthetics fill in gaps that are left when the natural teeth are lost. Full dentures replace an entire arch of missing teeth. This is a great solution for patients who have lost all of the teeth from the upper or lower arch of the mouth. In some cases, even if a small number of teeth remain, it may be more practical to treat patients with a full set of dentures than a partial set of dentures. This is typically the case if remaining teeth are in poor health. 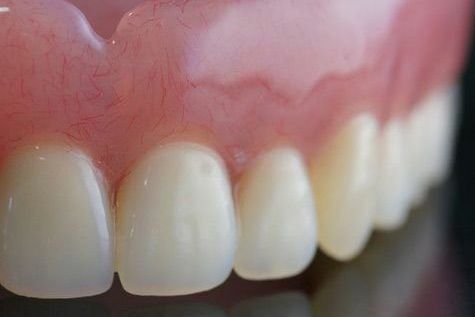 Although full and partial dentures are traditionally removable restorations that are held in place with a dental adhesive, they are also available as implant-supported fixtures. Because of the many advantages that dental implants provide, this is usually the preferred method of treatment, as long as the patient is an ideal candidate for the procedure. Dental implants are small titanium screws that fuse with the patient’s jaw bone and act as artificial tooth roots. A full or partial set of dentures can be supported with implants. With implants as an anchor, dentures fit more securely, are easier to care for, and look more natural. But one of the greatest advantages of dental implants is that they provide stimulation to jaw bone tissues and prevent the loss of healthy bone tissues. This maintains the structure of the mouth and jaw so that dentures fit and function properly for a lifetime. If you have suffered substantial tooth loss, you may be an ideal candidate for dentures. To find out more about your options, and whether traditional or implant-supported dentures could work for you, schedule an appointment at your earliest convenience by calling (425) 489-1177.